The secret to success on Pinterest is making beautiful, eye-catching graphics. You may look at them and think that it’s really difficult and you need expensive software or a degree in design, but I can promise you that that is not the case! 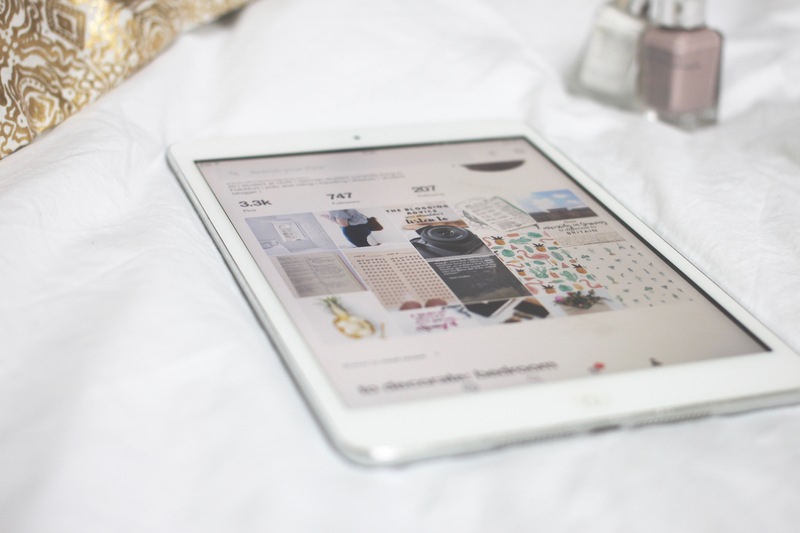 This post is a bit of a follow up to last week’s Pinterest guide, which if you’re wanting to start out and grow on Pinterest you should probably read first. To make visually-effective graphics on Pinterest, there is a few basic rules to follow which I’ll share and a couple of programme suggestions. I hope you find this post helpful, but as always, if you have any questions I haven’t answered, please let me know! To make a graphic for Pinterest, you need a vertical image. Because of the way pins are displayed, tall ones will stand out and are more likely to capture attention in feeds. When I take my blog photos now, I always try to take an additional portrait one to use for my Pinterest graphics. If you’re making pins for older posts and don’t want to retake blog photos, then you just need to be a bit more creative! You can try using a blank background, a patterned background and opaque overlay for text, a stock photo, or a collage of landscape pins to make it vertical. Adding text to an image is a very effective way of drawing attention in - make people curious and want to click through! Typography is important here as a good combination of fonts that complement makes a pin much more visually attractive. There’s a bit of a skill in choosing complementing fonts, and I could do a whole separate post on the topic as there's so much to talk about. I tend to use a cursive, calligraphy style font to capture attention and then simpler fonts which pair well - a bold, sans serif capitalised with letter spacing, and sometimes an italic, lowercase serif font to add some more information. The main thing to note with typography is that opposites attract. Don’t use two fancy fonts together, likewise don’t use two different sans serif fonts together. To get some inspiration, try searching font combinations on Pinterest. The actual words should not be overlooked. Use a heading that will entice people to click through to your post, and any information that will make them curious or want to know more. Usually most pins just have the title of the post, which is all you need if it's attention-grabbing. Your text should be super easy to read. If it is hard to read, it may just get scrolled past - not what you want. To help with legibility, you could add a background to the text to make it stand out from the picture - I tend to add a white, semi-transparent box behind my text, but only if here's lots going on in the picture. Also, use contrasting colours to the photo for the font - if you’ve got a lot of white or light colours in your photo use black or dark text, if you’ve got darker colours, use white. Add your blog website to the pin somewhere. It prevents people outright claiming it as their own, and people then recognise it as yours. It’s also useful should the link get broken, though you should try to keep on top of this. Light, bright pins do better on Pinterest. Don’t over complicate it with loads of colour or loads of text, keep it simple, clear and easy to read! Less is usually more when it comes to design. Keep your pins consistent. It helps with your branding and they become recognisable! Try and find your style and stick to the same fonts. Don't worry too much at the start, my pins varied a lot until I found a style I liked and kept coming back to. Just experiment! Photoshop - Not free, but much more flexibility. Highly recommended, and also useful for other photo editing! Illustrator or InDesign - Other Adobe Creative Cloud Apps, of which I use the most often. I have templates set up so I can easily swap out photos and texts and then they're done. PicMonkey - Another free web application. I don't use this so can't really talk too much about it, but it is often highly recommended among bloggers! I hope this is helpful! If you have any questions or want a tutorial on specifically one of the programmes, just let me know.